The Sicilian word "ngiuria" literally, means "insult". The plural form, meaning "insults", is "ngiurii" (in English phonetics, n-JOO-rih-yih). In common usage, the word also refers to descriptive nicknames that were given to individuals and sometimes their whole families. The words are also sometimes spelled "nciuria" and "nciurii". The Italian word is "sopranome". I believe one reason for the wide use of nicknames was the Sicilian Naming Convention, by which a couple's first son was named after his paternal grandfather, second son after his maternal grandfather, first daughter after her paternal grandmother, and second daughter after her maternal grandmother. In the next generation, this could lead to several cousins of about the same age with identical names. Pietro Rossi, for example, could have five sons, and if they all had sons and abided by custom, there would be five cousins named Pietro Rossi! To distinguish between these cousins, the fat one might be called Pietro Grasso Rossi, the tall one Pietro Longo Rossi, etc. Their descendants then might carry both names forward to future generations as 'compound surnames'. The following essay was brought to my attention by my friend Anthony Di Renzo of Ithaca College. It was written by Angela Marino for the website siciliafan.it, which also posted this Sicilian street scene. I have translated it from Italian, and added some of my own "ngiurii" , shown in red italics, and have included some thoughts afterwards. 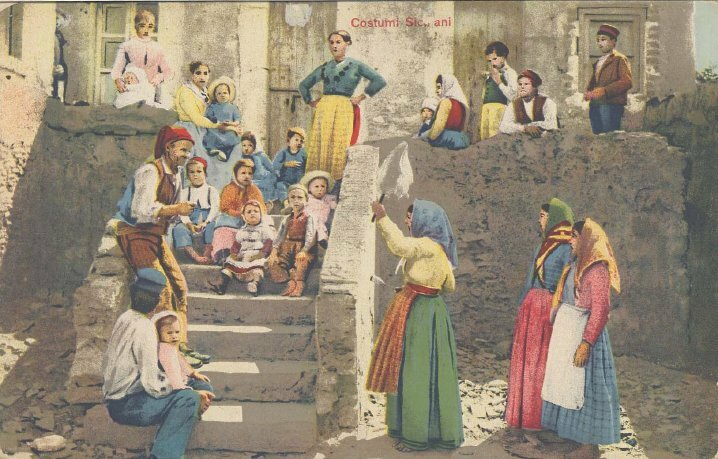 Ancient Sicilian tradition gave great importance to nicknames; "ngiurii", or "insults" as they were called in Sicilian. Their origin is lost in the mists of time; they often stemmed from the place of origin of a person or his work, or a physical characteristic or his attitude, or the names of animals and things, or are a form of onomatopoeia ... . sometimes they are words or expressions difficult to relate to something concrete, and meaningless (at least for those of our era). Li ngiurii have always been part of Sicilian culture and have always been widely used, especially in small towns where people are known more by their ngiuria than by their surname. Alas, however, to call a person directly by his ngiuria, great offenses and bloody fights could break out. In fact, while in other civilizations, the nickname was often used to glorify a character or to distinguish him through homonyms (Example: Alessandro "Magno", or "the Great"; Frederick "Barbarossa", or Redbeard"), in the Sicilian culture, "ngiuria" means "insult, offense," even when there may be nothing offensive in the inherent meaning of the word. However, the fact is that these "ngiurii" can be duly declined in masculine, feminine and plural forms, and, preceded by the articles "lu" (masculine "the") for men, "la" for females and "li" for the plural, were often automatically extended to whole branches of the family and handed down from father to son. Today some of them, Italianized, have become second surnames, officially recorded at the registry, and serve to distinguish the various branches of an ancient family, or have even become surnames themselves. For example, Petru Fuddruni, if I remember correctly, is the nickname of a character in the popular Sicilian narrative, a kind of "stooge". Well, his ngiuria, duly Italianized as "Fullone", is now often officially recorded in registry offices, like a second surname. One last thing: we generally talk of ngiurii as something outdated, an ancient custom: nothing could be more wrong! The tradition of ngiurii is still active and thriving on our beautiful island [and even in in Sicilian American communities]! How else to explain nicknames such as: "Charlie the Hat", "Joe Nerves" or "Sammy the Horse"? * Note: 'Place of origin' ngiurii did not necessarily mean that the person was from that place. It might mean that he/she had the mannerisms, speech patterns, or physical appearance (real or imagined) of someone from that place. Such surnames also were commonly given to foundlings to indicate that they were from 'somewhere else', that is, out of wedlock. ~ The Lady of the Wheel (La Ruotaia), my first book, inspired by my genealogical research of Sicilian families. It's a historical novella about foundlings and sulfur mine workers in 1860s Racalmuto, a town in central Sicily.